She and wife Sophie Keir were celebrating their birthdays in Paris when Millett suffered a cardiac arrest, according to the New York Times. Born in Minnesota in 1934, Millett attended the University of Minnesota before becoming the first American woman to receive a postgraduate degree from St. Hilda’s College at Oxford. Millett married sculptor Fumio Yoshimura and moved to New York in 1963, where she joined the National Organization for Women and spent much of the remainder of the ’60s as a prolific artist. She decided to pursue a doctoral degree in English and comparative literature at Columbia University in 1968. It was there she wrote her dissertation that would become the inspiration for “Sexual Politics,” which details what she saw as the subjugation of women in celebrated works of literature and art. Challenging the ideas of male contemporaries, Millett’s book catapulted her into the limelight amid of rise of second-wave feminism. 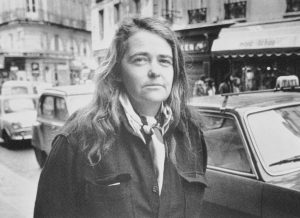 “The world was sleeping, and Kate Millett woke it up,” feminist writer and critic Andrea Dworkin wrote of Millett’s contributions years later. A fierce advocate of humane psychological treatment, Millett would also write about her hospitalization for bipolar disorder in “The Loony-Bin Trip,” published in 1990. Minnesota eventually changed its involuntary commitment laws thanks, in part, to Millett’s efforts against institutionalized psychiatric care. She wrote “Mother Millett” in 2001, chronicling her relationship with her aging, infirm mother. Millett was the recipient of many awards, including Yoko Ono’s Courage Award for the Arts in 2012, and was inducted into the U.S. National Women’s Hall of Fame in 2013. Editor’s note: Kate Millett’s name was misspelled in an earlier headline. Left: American feminist leader Kate Millett, best known for her 1970 book “Sexual Politics,” died Wednesday in France at the age of 82. Photo by Getty.